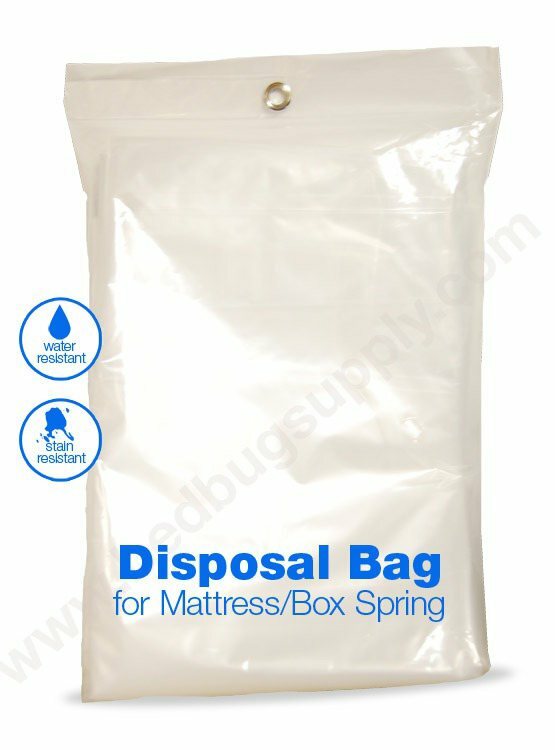 In most cases a mattress or box spring can be saved by simply treating them with STERI-FAB and encasing them with a SafeRest Mattress Encasement, but if it's time for a new mattress or your mattress is covered in bed bug feces, our disposal bags may be the answer. They are made from a fairly thick 2 mil plastic, can fit up to a 15" thick mattress and may be sealed at the end with packing tape (air vents to make it easier to put the mattress or box spring inside must also be sealed with tape). 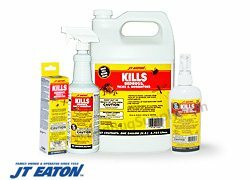 Mattress bags are not only the responsible way of disposing of an infested mattress, but can also limit the chance of spreading beds bugs throughout your home during removal. We do not suggest sleeping on a mattress bag as they will be noisy, hot and uncomfortable. They are simply made to remove a mattress or box spring from a home. Also, due to the increase in bed bug-related complaints within the City of New York, the department of sanitation has created a set of new rules for disposing of mattresses and box springs. On December 3rd, 2010, the New York City Department of Sanitation began requiring that all city residents fully encase within a sealed plastic bag all mattresses or box springs being discarded for DSNY collection. Under the new rule, failure to place a mattress or box spring out in a proper bag can result in a $100 fine. Our bags fully comply with the requirements this city ordinance. 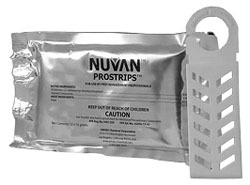 Our disposal bag and some packing tape is all you will need to get the job done. All bags are water and stain resistant (once the air vents have been sealed with tape), and also recyclable. Our mattress bags can also be used to protect your mattress and box spring from dust, dirt, liquids and oil during transportation or while they are in storage (once the end and air vents are sealed with tape). Q: Are these sufficient to dispose of one infested full size wooden bed frame (includes head & foot boards) and if so, which size do you suggest? If your bed frame fits in the sofa bag (which measures 45" x 152"), then you could use that. Otherwise, the other sizes would not be appropriate for a bed frame. Q: How many bags for mattress disposal do you get in a pack? These are sold individually. The price you see is for one disposal bag. Q: Is the bags clear or white? Do you supply bags that are black or any darker color? These are only available in clear color. The manufacturer does not offer them in white or black. Q: Does one "unit" contain two bags to take care of the mattress AND box spring, or do I need two "units"? You'll need one unit for the mattress and another for the box spring. Q: Will this work for moving and storage as well as disposal? It definitely can, and we've had customers do so successfully. Perfect, great price, fast delivery! Very pleased. Reviewed by: Eve from Brooklyn. Very quick, cheap, and convenient. Thank you! Reviewed by: Dani from DC. Thank you the item came in quite quickly. It was as describe. We had no trouble using it and it worked perfectly. Reviewed by: Dawn from Califonria. VERY FAST DELIVERY. GOOD QUALITY BAGS. MADE MATTRESS DISPOSAL EASY. Reviewed by: JANIE-D from Fairfield, OH. product came on time and exactly what i wanted, no hassle and reasonable price with free shipping, i am happy with it. Reviewed by: Susan from New york . Reviewed by: John schaefer from 6007 Riverdale ave. 6007 Riverdale ave. Excellent product. Cost effective. Timely delivery. Very good value. I am very grateful. Much, much better than the big home-related chain stores. I'd recommend it to anyone looking for this item. Reviewed by: Eleanor Cole from 350 Portico Way, Apt.122, Charlottesville VA 22911. Reviewed by: Amy from Brooklyn. When a tenant moved out of my 2nd floor apartment, I had to find a way to dispose of a mattress they left behind. Upon researching, I realized that NYC allows mattresses to be disposed with regular curbside garbage, but it must be in a proper disposal bag. I was not happy to think that I had to incur additional expenses, but immediately searched online for disposal bags. I was very pleased to find that Bed Bug Supply offered the necessary bags at very affordable prices. And the most surprising part was the free shipping. Package arrived very quickly and I was able to dispose of the mattress with no problem. I will definitely keep this company at the top of my list for any future needs that they can fulfill. My experience has been excellent and I would greatly recommend them. Reviewed by: Marcelo from Queens, NY. Excellent product, good price, fast shipping. Reviewed by: J Cleary from Dayton, OH.